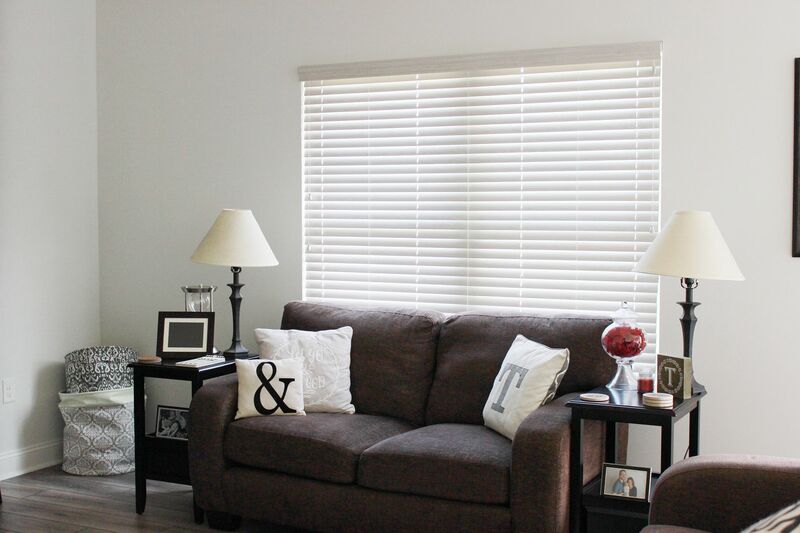 Thank you Comfortex for providing the Aria blinds for me to review. All opinions are completely my own. Slowly but surely our house is coming along. The boxes have been unpacked, items are mostly organized, and I'm feeling a bit more settled. If anyone has ever built their own house, you know there are several things that you just don't think about adding until you move in. One of those things is window coverings. The options are endless, it seems, for blinds and window coverings. Luckily we discovered Comfortex Window Fashions and we couldn't be happier. Comfortex has multiple types of window coverings to choose from including cellular shades, wood blinds, roller shades, roman shades and more. My favorite part about our new house is the grey wood flooring on our lower level. 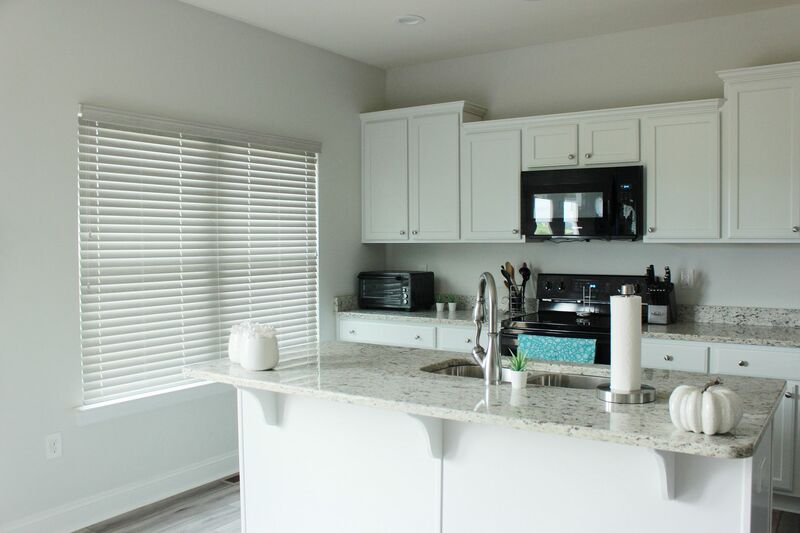 We decided on the Aria Advanced Faux Wood Blinds in Whitewash to go with our neutral color palette in the house and to complement our floors. I'm a huge fan of faux wood blinds because I like how attractive and classic they look. Also, faux wood is necessary if you are going to have blinds in high humidity areas like the kitchen or bathroom. 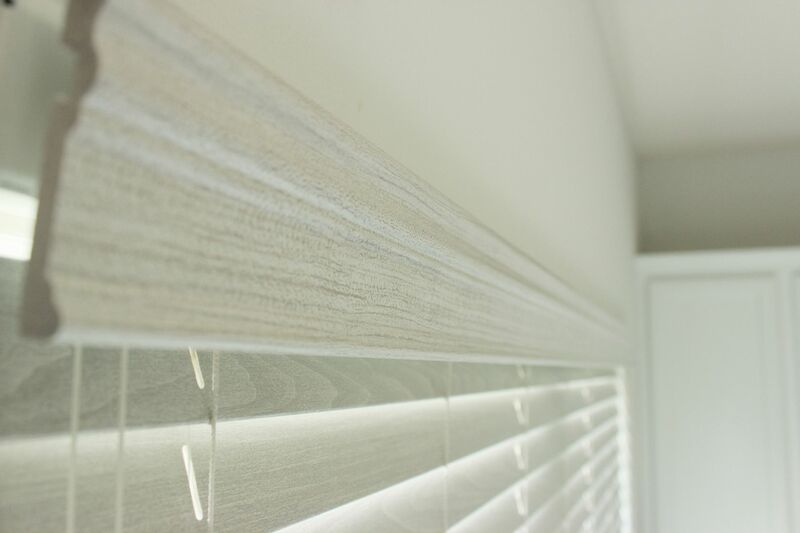 The Aria blinds resist warping, cracking, chipping and fading while holding up to the rigors of everyday life. 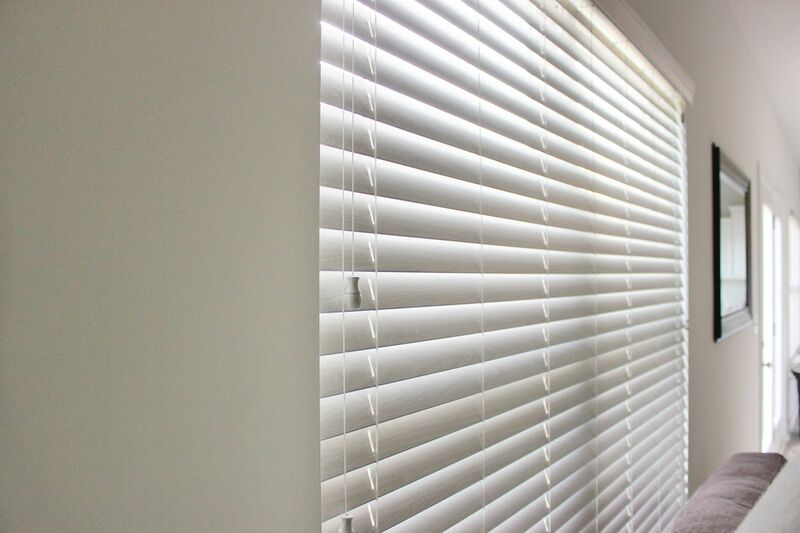 In fact, the Aria blinds are guaranteed not to warp in temperatures up to 148 degrees. We got two sets of Aria blinds, one for our kitchen and one for our living room. I took some simple measurements of our windows and our custom blinds were created from that. Installation was an absolute breeze (says the person who stood back and watched). Tolar and my dad put the blinds up in a matter of minutes - seriously. The included instructions were clear, thorough, well written and easy to follow. 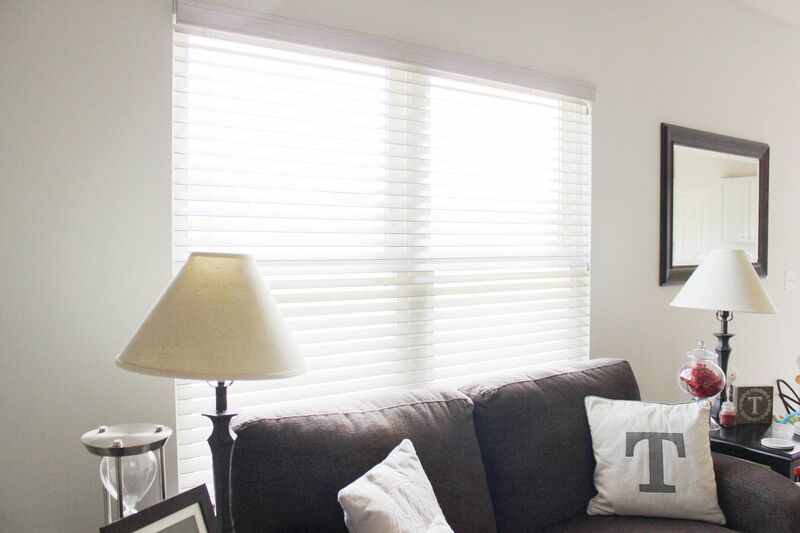 And the blinds themselves are lightweight, making them easy to handle and hang. Thanks to the simplicity of the design, the instructions are almost unnecessary. Though an extra set of hands is appreciated, one person could easily install these blinds by themselves. The Whitewash color has a greyish tint to it and we absolutely love it. I know sometimes the colors on websites look different than in real life, but I have to say the color of our blinds is almost identical to what you see online. I like having something different than just a basic white as it gives each room a little extra dimension. We are very pleased with the blinds. The quality is amazing, I would even use the phrase top notch. They raise, lower, open and close with ease. As Tolar says "the gear mechanisms are fluid." 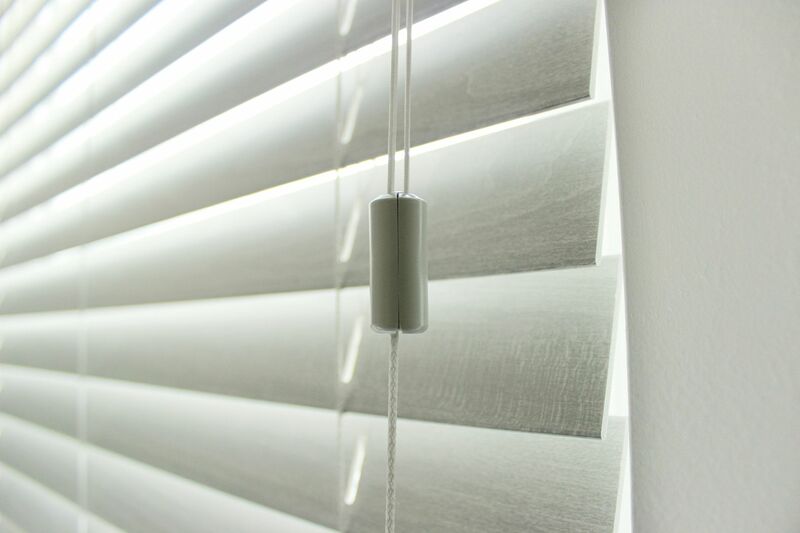 The blinds are so durable; we never fear that we might break them or pull the cord out whenever we raise them. 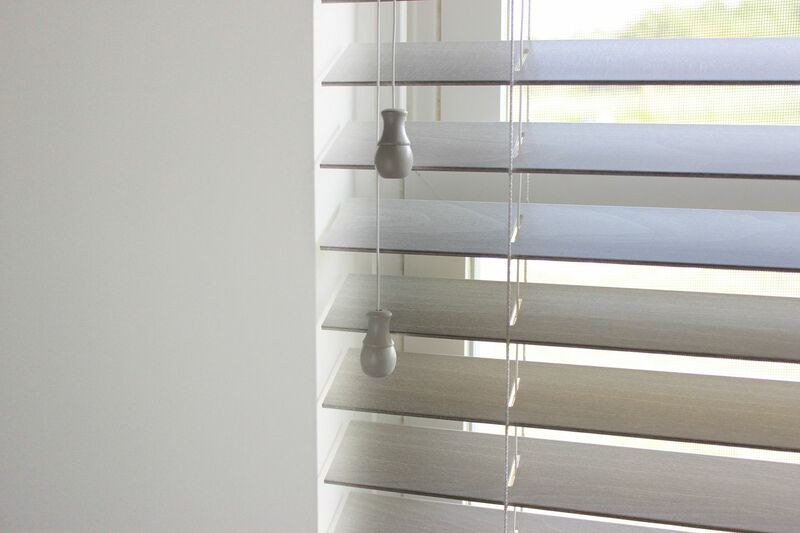 With everything being so fluid, when you open and close them you can make minor adjustments and don't have to yank on the cord to get the blinds to move. They also keep out quite a bit of light. 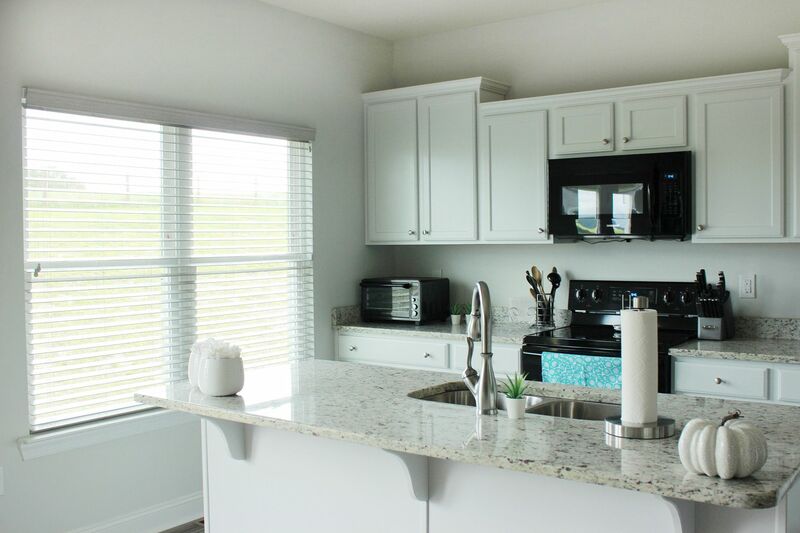 We lived in our house for a couple months without window coverings and the day we installed them it made such a difference. One of my favorite features is how the cords are contained. I don't have to worry about excess cords hanging out for my little ones to grab and all cords are high enough and out of their reach. Scroll to the bottom of this post and I'll share Comfortex's child safety tips with you. You can never be too careful where your children are concerned. So please be aware when you are installing your window coverings to install them properly. 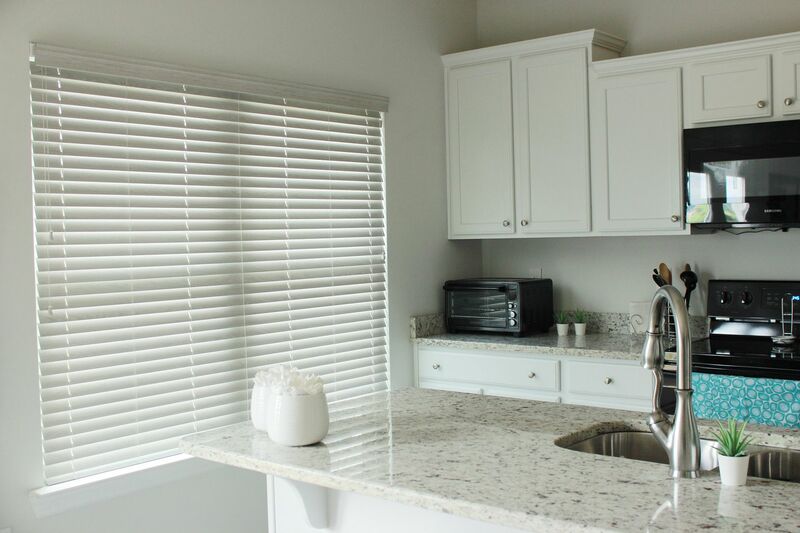 I would even recommend if you are looking for window coverings for your children's rooms that you look at installing the cellular shades from Comfortex (they come in over 800 colors!). 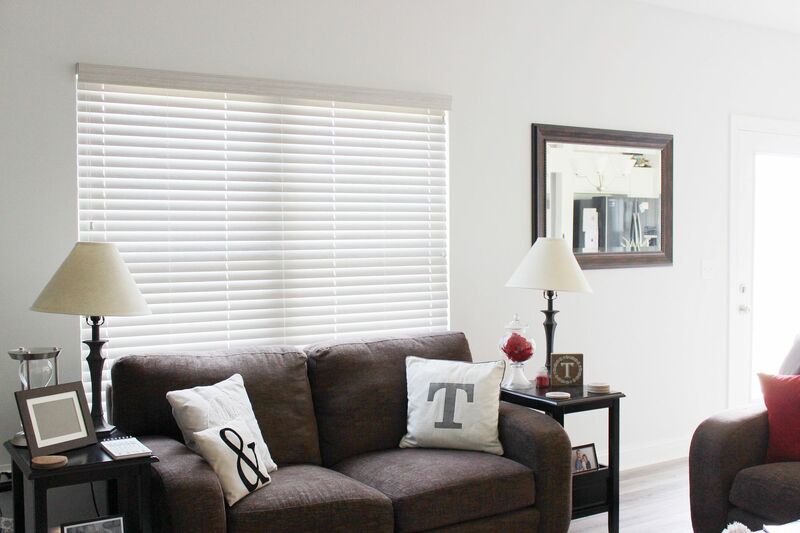 Be sure to check out Comfortex if you are looking for new window treatments, I cannot recommend them enough! 1. Be sure all window treatments are properly installed and compliant with current safety standards. 2. Always keep windows closed and locked when small children are in the room. 3. Do not place cribs or other furniture near windows. 4. Never allow anything to dangle in a crib or bed. 5. Never allow long window covering pull cords to “puddle” on the floor next to the window. 6. Choose the cordless shades option whenever possible. 7. Hang stylish crib comforters or other bedding items on the wall, instead of placing them in the crib. Fluffy comforters or pillows, while adorable, have the potential to smother or suffocate a baby. 9. Changing tables should always have safety straps. 10. All electrical outlets should be covered – in every room, not just the rooms you think children are most likely to be in. We brought blinds that are cordless. BTW your pictures aren't showing up.